IEEI.TV is a 30 year old technology company located in Newport Beach, California. As a California corporation IEEI.TV provides a wide range or products and services to rich media companies in Broadcast, Post Production, Animation, Editing, Film and Enterprise. The solution has been tested by AP Associated Press ENPS for use in SNAPfeed to allow for output of WM9 video to SDI in a Windows 2003 computer. Please contact IEEI for more details including pricing and delivery. NVIDIA Quadro FX 4500 SDI is the ideal solution for on-air broadcast professionals across many applications such as virtual-sets, sports and weather news systems to composite live video footage onto virtual backgrounds and send the result to live video for TV Broadcast. Additionally the solution allows film and video production and postproduction and finishing professionals to preview, in real time on HD broadcast monitors the result of 3D compositing, editing and color grading. This graphics-to-video out solution delivers uncompressed 12-bit SDI from programmable graphics enabling a direct connection to broadcast monitors, tape decks or SDI projectors. NVIDIA Quadro FX 4500 SDI provides two channels, fill or key, of 8-, 10-, 12 bit uncompressed SDI in 2K, HD and SDI formats and analog and digital synchronization. It supports both Microsoft "Windows" and Linux and works on top of existing applications or can be easily integrated within a broadcast and video editing application through the NVIDIA API. NVIDIA Quadro FX 4500 SDI features a revolutionary new architecture with 2x the geometry and fill rate and 4x the hardware pixel read-back performance of the previous generation graphics. It supports 512MB ultra-fast GDDR3 memory and rotated grid full screen antialiasing (RG FSAA) for increased color accuracy and visual quality of edges and lines without compromising performance. 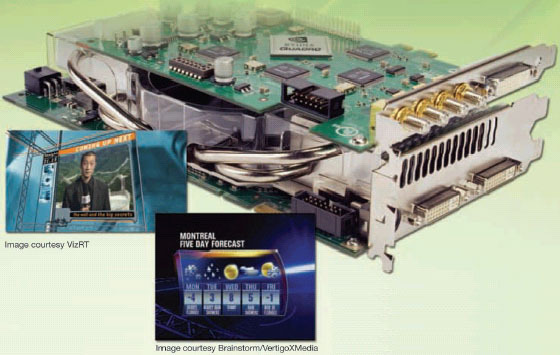 NVIDIA Quadro graphics boards provide the ultimate in quality, precision, performance and programmability. Broadcast and DCC applications acquire a new level of interactivity by enabling unprecedented capabilities in programmability and precision. For the first time production rendering becomes an integral function of the design workflow, shortening the production process and enabling stunning on-air 3D graphics. Form Factor ATX, 4.38"x 9.0"
Genlock (House Synchronization) One digital and one analog genlock (BNC) connectors provide Connective to a video sync source for SMPTE standard (digital, black burst, tri -level) synchronization. Unparalleled Sub-pixel Precision 12-bit sub-pixel precision delivers high geometric accuracy, eliminating rasterization anomalies. Unmatched Color Precision Full 128-bit precision graphics pipeline enables sophisticated mathematical computation to maintain high accuracy, resulting in unmatched visual quality. Full IEEE 32-bit floating-point precision per color component (RGBA) delivers millions of color variations with the broadest dynamic range. Next-generation Vertex and Pixel Programmability NVIDIA Quadra FX 4500 GPUs introduce infinite length vertex programs and dynamic flow control, removing the previous limits and complexity and structure of shader programs. With full support for vertex shader Model 3.0, NVIDIA Quadra FX 4500 GPUs deliver sophisticated effects never before imagined for Real-Time graphics systems. Rotated Grid FSAA (RG FSAA) RG FSAA sampling algorithm introduces far greater sophistication in the sampling pattern, significantly increasing color accuracy and visual quality for edges and lines, reducing "jaggies" why maintaining performance. NVIDIA PureVideo technology NVIDIA "PureVideo" technology is the combination of high-definition video processing and software that delivers unprecedented pictures clarity, smooth video, and accurate color for SD and HD video content. Features include spatial temporal de-interlacing, inverse telecine, and high quality HD video playback from DVD.